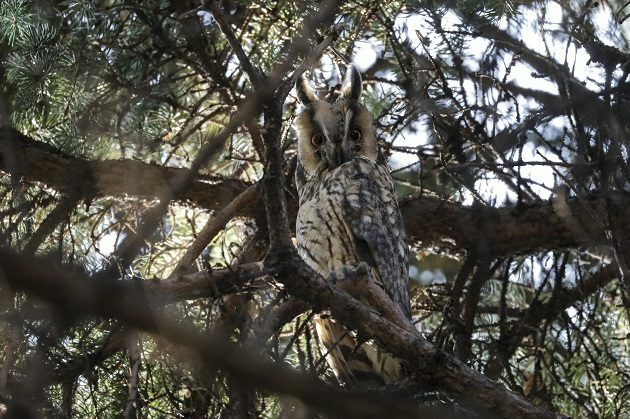 Have you heard of a small town in Serbia graced by the presence of its 700 communally roosting Long-eared Owls? You may have read about them in the Wall Street Journal, the BBC Wildlife Magazine, or perhaps watched them on BBC, who filmed them here twice, for the Planet Earth II in 2015 and for the One Planet in 2018. Actually, the numbers are even higher. 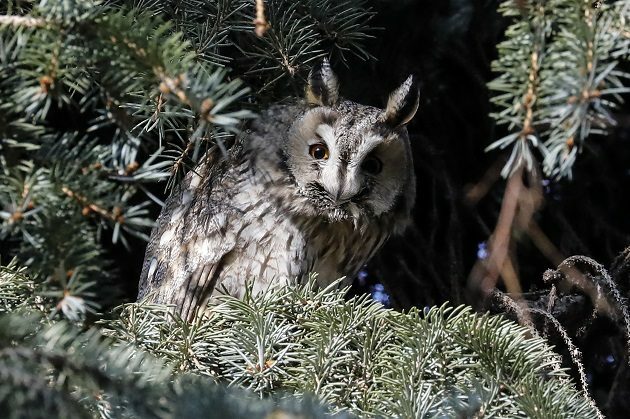 The world record 734 Long-eared Owls were counted here in December 2009, in the pines and spruces, lime, chestnut and nettle trees lining the central square by the orthodox church in Kikinda. The best decorated single tree had 145 owls in its crown. Rightfully, this town centre doubles as a nature reserve – an officially protected owl habitat. Wanting to celebrate the owl that has brought birders from many European countries, even from USA, Canada, Australia, Hong Kong and China to their town, the authorities have erected the One Owl, a 9 ft terra-cotta statue of an owl by a local sculptor Jovan Blat. 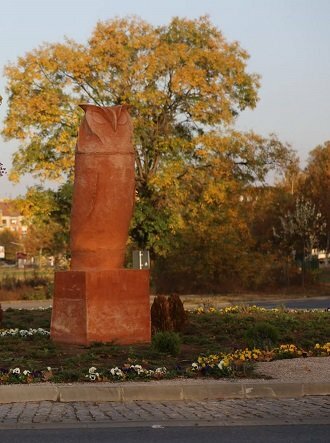 But, rather than an owl, many have seen a phallus in it and that was the reason I joined one media team heading for Kikinda to film the sculpture first, and live owls second. Driving north from Belgrade, we had two flocks of Common Cranes, about 100 birds, flying low in formation near the Carska bara Ramsar site – November is the height of their autumn migration. At the roundabout at the entrance to Kikinda, the new sculpture awaited us. Many social network protesters found it obscene. Well, an owl it certainly is, but if you want to see it that way, a fertility symbol it may be as well. There’s nothing wrong with either, but the prudish protesters demanded its removal and the ever populist authorities were quick to announce that the sculpture will be replaced with a different owl sculpture. Before the owls brought tourists, billboards along the main road proudly called the town “Kikinda – the Tile Capital”, after its tile factory, which is hardly a reason for any tourist to consider visiting the place. Yet, even if it were not for the tourists, this owl should be applauded by the local farmers: during the five winter months, they eat about half a million voles and mice. Soon, we parked by the main square and asked one of the curio sellers where are the owls? “The autumn is too warm and I haven’t seen any. They can be seen in those tree crowns, but they aren’t here yet.” A good thing that I didn’t trusted him. He hasn’t seen any, but have they arrived is an entirely different matter. The first flocks are to be seen even in September, however few they may be at that time, and I was sure that by mid-November there must be some owls around, a hundred or so at least. So we checked the trees behind the Church of St Nikola (built in 1773) and to the left. The birds themselves are very unobtrusive and hard to spot, but there is a tell-tale sign: their droppings. Yet, how to tell the owl droppings from e.g. Common Woodpigeon’s? Among owl droppings there are regurgitated pellets, which is not the case with pigeons. And soon, we had our first live Long-eared Owl, followed by several more in the next spruce. Several interviews with local officials and 30 owls later, we found ourselves in front of the pizzeria, right behind the church. About to enter, but there’s one owl in that pine… wait, two… no, four… no, more… six, seven? It is a small tree crown without many places for a crow-sized bird to hide, but what we thought to be one bird soon become ten Long-eared Owls, plus five more in the lime next to it. Dozy birds, they hardy gave us a glance with those ambers eyes. Still, irresistibly adorable, nevertheless. Finally, Kikinda is not the only place with winter roosts of owls, but deservedly the most famous among them. It is estimated that some 30,000 LEOs in about 450 roosts overwinter in the country. Most of them hold a few dozen birds, several have 400 and then comes the crown jewel – Kikinda, the World Owl Capital. The best season is from mid-November to mid-January, the colder – the better. Long-eared Owls’ numbers fluctuate from 200-300 in warmer to 500-700 in colder winters. Check the trees at the Srpskih Dobrovoljaca Square, particularly behind and around the Church of St Nikola. Finish with pizza and sljivovica.